Imagine you’re a penguin. First of all, you’re a bird that can’t fly. That’s got to be embarrassing enough. Then, on top of that, you live somewhere way down at the bottom of the globe, not too far north of the South Pole, on some desolate island or coastline with a bunch of other flightless yokels staring at ice all day. Pretty boring stuff. That is, unless you’re frantically running (again, not flying) for your life to keep from being some sea lion’s next frozen dinner. I’d say you definitely deserve a vacation. So check out these wonderful travel brochures I have on…um…the North Pole? A hand and the store. 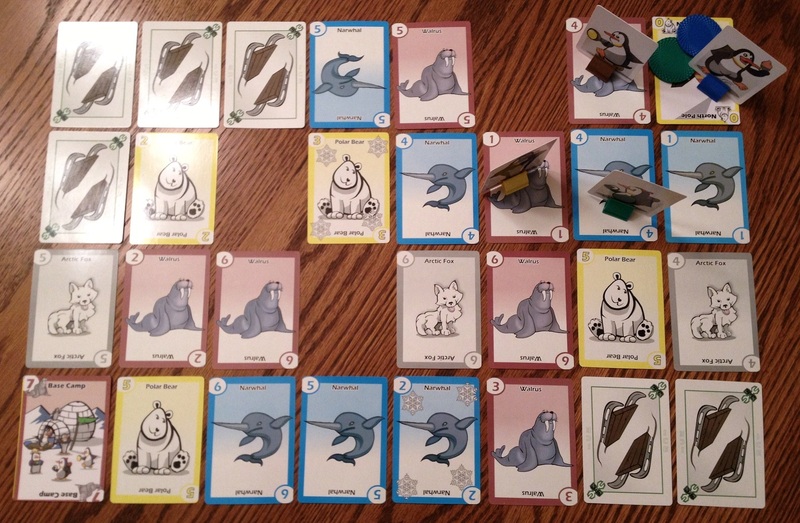 A card is one of four colors (each suit depicts a different arctic animal) and has a number, as well. Playing from your hand, you can move in one of four different ways. You can waddle to an adjacent face up card (orthogonally or diagonally) by playing any number of cards of that same color that add up to more than its value. You can snowshoe to a similar card by discarding one or more cards that equal its value – then you can move again, if able. You’re also allowed to move onto face down ice cards. Moving to one of these spaces requires three-of-a-kind of any suit, called sledding. Or if you have three-of-a-kind in the same color you can move two spaces, or dog-sled. Either version of sledding also gives you an extra move, if possible. When you move onto a card, you will “explore” the orthogonally surrounding ice by turning up any face down cards next to or beneath you. Finally, if you played any cards with a snowflake, a blizzard occurs. For every snowflake card you play, you can discard any ice space from the board (as long as a snowflake or another penguin is not on it), or you can repair a resultant hole in the ice made earlier by just such an occurrence. To finish your move, draw two cards from the deck or take two from the store, replenishing those from the draw pile. Keep in mind your hand limit is seven. Rinse, lather, and repeat until one penguin has been there, done that, and got the tuxedo. Is it Cute and Cuddly? Well, it’s got penguins. Those always seem to be a hit with kids and families in art, movies, cartoons, and popular culture. From Chilly Willy to Club Penguin and from Skipper, Kowalski, Private, and Rico to Zidgel, Midgel, Fidgel and Kevin, the formal, arctic birds usually pull their weight in appeal. They’re no strangers to gaming, either. (Also, I can’t pass up this opportunity to plug the St. Louis Zoo’s Penguin & Puffin Coast exhibit – very neat, my kids love it, and highly recommended!) The game North Pole is no exception. Although the art is a bit minimalist, you’ll soon be dancing with your kids on happy feet. They’re not too bright, though. The penguins, I mean. I know opposites attract. But vacationing to one pole from living at the other? Well, I suppose the derogative “bird-brain” originated for a reason. The cute and cuddly cast. This fast and fun racing game is a breeze. The rules are easy and play is very accessible. Very young kids may need help with the math, but that’s fine as it’s a great opportunity to learn basic addition. When playing with my 5-year old daughter (not yet in kindergarten) we have open hands to help her add, while she has no issues with collecting sets of three or matching colors or recognizing how to utilize them to accomplish one of the four different kinds of movement. She also relishes in using blizzards to break the ice right in front of me! Older kids should appreciate how the basic mechanisms really mesh together and afford occasions for cursory decision-making. It’s not deep or taxing, but that’s the point. Luck is inherently present with the nature of the draw, but the store provides open information at the same time with which to try and collect cards. Every now and then you will be stuck and cooling your heels until you can obtain the right cards to move, but it’s not terrible. Also, you must tag the North Pole and reach Base Camp to win via normal card play and movement rules. The North Pole is a yellow ‘0,’ so any yellow card will land your there. However, Base Camp is a brown ‘7’ – higher than any other ice card – and so you need the proper suit match or a three-of-a-kind. Normally it’s not a problem, but be prepared for a couple unlucky draws to stall you at the finish line as a black-and-white blur races by you for the win. The snowflakes allow for limited interaction which can prove a hindrance, but not crippling, and the damage is always repairable. The hand limit and movement choices keep things waddling at a brisk pace, and still create a tight race. On top of that, North Pole scales very well for any number of players. Wrap it all up in its cheap, plastic clamshell and you have an entertaining game for kids that parents will honestly enjoy playing, too. Component quality and graphic appeal are on the Spartan end, which is not atypical of products out of Cambridge Games – a smaller, independent publisher forgoing flash and chrome in favor of value and game play. The pieces are generic, but functional. The card stock is of modest weight, and should hold up over time given the limited shuffling necessary. 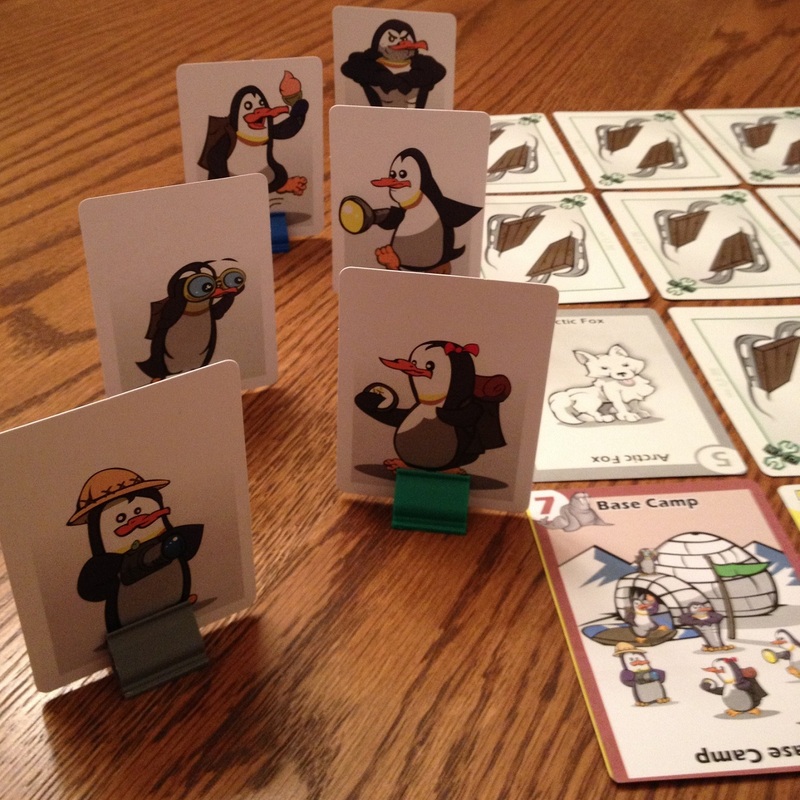 The six penguin racers are simply rectangular card stock on a plastic stand. While somewhat subdued, they are cutely drawn and each one unique. But overall the graphics and artwork lack that ‘wow’ factor which may work against attracting the youthful target audience it seeks to grab. 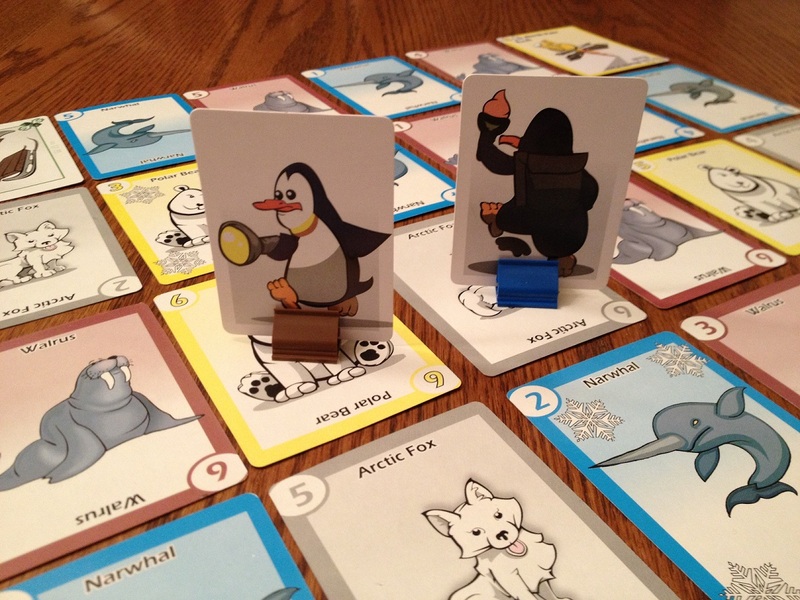 North Pole is not a gamers’ game, but really just missed out with one or two tweaks to broaden its appeal, even if just a little. 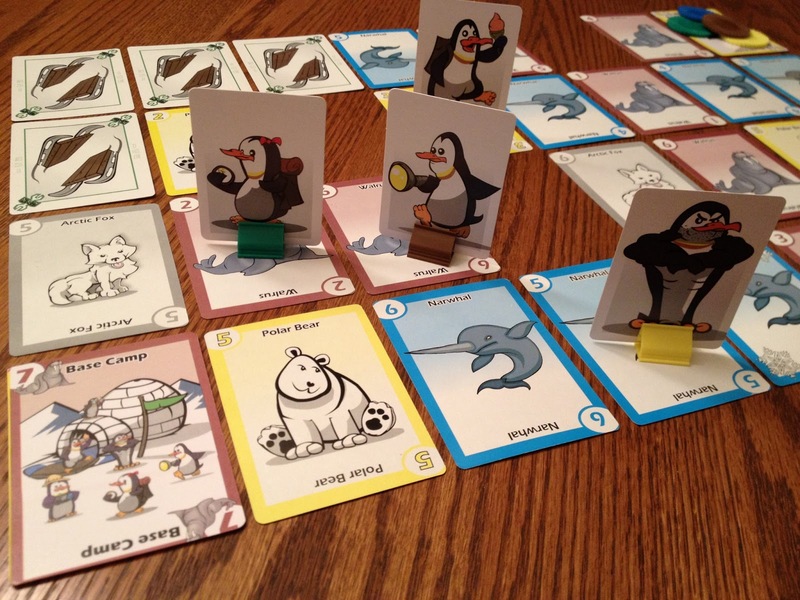 The penguin pawns are already distinctively drawn, so adding a unique, rules-breaking ability for each one would provide for some chaotic variability. Plus ramping up the spite factor as an optional rule could be entertaining for the more cutthroat among us. This isn’t a criticism, because it was not the game’s goal. Nor would tweaks create anything more than a filler for serious players. But it could boost the maturity level a tad for adult gamers…and be fun. The yellow cards already depict adorable polar bears, but how much cooler would it be if they could ferociously chase the racers all around the ice? And how about killer whales?! Front and back is a nice touch. 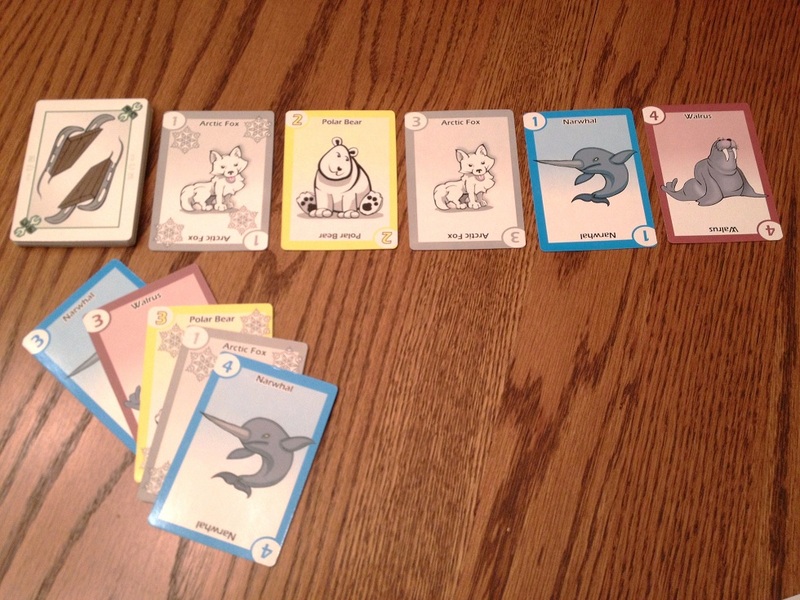 So North Pole is what it is – an easy, light, and quick family game of speed, adding, matching, and a hint of blocking. What it lacks in shiny bits it makes up for in cuddly penguins, and just enough so to interest the little ones. It’s fun, almost always close, and provides a good time for the whole family. With an educational component for the young and the chance to actually make a few decisions, this kids game rises above its lifeless, and flightless, commercial competitors. 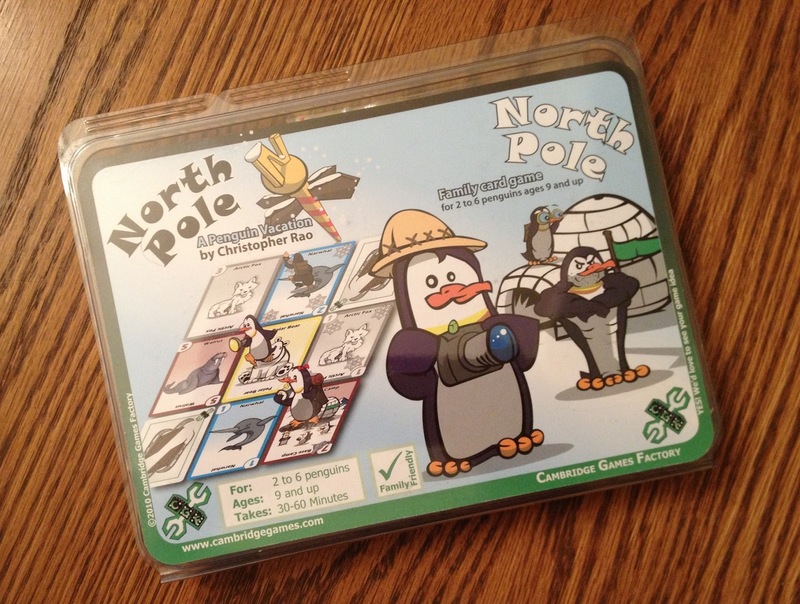 iSlaytheDragon would like to thank Cambridge Games Factory for providing a review copy of North Pole. Next Article Guide to Gaming: Which Games Should I Buy First?